The headset is a component of the bicycle that is often the least-understood and most overlooked by the casual cyclist. However, it is one of the most important components in the smooth, efficient, and safe operation of your bike. The headset is the collection of ball bearings and related parts within the steering mechanism on the front of the bike. If your headset is not properly adjusted or in need of service, it can cause your bike's steering to feel stiff, erratic, or not be able to steer at all. Even a brand-new headset requires adjustment by a qualified bicycle mechanic. A professional mechanic knows how to find the right balance when adjusting the headset bearings; just loose enough so that the steering moves freely, but just tight enough to eliminate any "play" or wobble in the steering. One reason that many people are not aware of the headset is because most of it is usually not visible on the outside of the bike. The part of the headset that you can see are just the edges of the "cups" that hold the upper and lower sets of bearings. The headset cups are pressed tightly into the head tube, which is that short, vertical part of the bike's frame at the front of your bike. Sometimes, you can't even see the headset cups, as is the case with "integrated" headsets, where the cups are built into the frame's head tube (see image at right). Headsets come in two main varieties: threaded and threadless. The type of headset must be the same as the type of stem, which is the "neck" that connects your handlebar to the bike. The headset and stem must also match the type of steerer tube, which is the long rod that rotates freely inside the head tube, and is connected to the fork, which is the two arms that hold your front wheel in place. The headset, stem, and steerer tube all work together as a system, and there are some advantages and disadvantages to both the threaded and threadless systems. Threaded headsets are easily recognized by the one or two large six-sided nuts that sit on top of the head tube and upper headset bearing cup (see image at left). These nuts screw onto threads that are cut into the steerer tube. The tension of the headset bearings is adjusted by manipulating these two nuts. Threaded headsets are found on many older bikes, as well as many modern hybrids, cruisers, and kids' bikes. The advantage of threaded headsets is that they allow you to easily adjust the height of your handlebars. It is NOT necessary to loosen the two large headset nuts to adjust your handlebar height. There is usually a single allen-type bolt at the top of the stem; all you have to do it loosen this bolt, adjust the height of your stem, make sure the handlebars are still aligned with your front wheel, and re-tighten the allen bolt. The amount you can raise your stem is limited, however, by the amount of slack available in your brake and shifter cables. 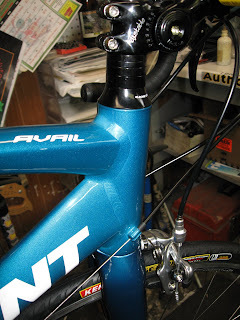 Also, most stems will have a dashed line engraved in them indicating the upper height limit; do not raise your stem higher than indicated, or you risk serious damage to your frame and/or stem, or serious injury to yourself. There are two main disadvantages to threaded headsets. The first is that the threaded system is typically heavier overall compared to threadless systems. The second disadvantage is that you need a pair of headset wrenches to make adjustments to the headset bearing tension. These headset wrenches are rather large and heavy, and not very convenient to carry with you to anticipate making adjustments while out on the road. Threadless headsets are easily recognized by the absence of the two large headset nuts. The tension of the bearings in a threadless headset system is adjusted using a long allen bolt that is inserted vertically through the top cap; it extends down through the stem and into the steerer tube, where it is screwed into a special star nut that is wedged into the inside of the steerer tube. 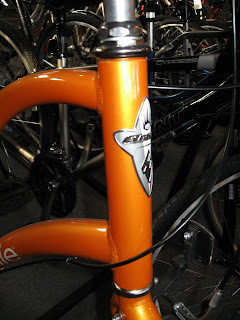 The outside of the steerer tube is smooth, and the stem clamps around it, and is tightened in place by one or two more allen bolts that are situated horizontally at one end of the stem (see image at right). Threadless headset systems are typically lighter overall compared to threaded systems. The other main advantage to threadless systems is that all of the bolts can be adjusted using allen wrenches, the common sizes that are available on compact folding tool kits that most cyclists carry with them while on the road or trail. This makes it convenient to make any necessary on-the-fly-adjustments. The downside to threadless headsets is that they provide a much more limited range of adjustment for the height of your handlebars. 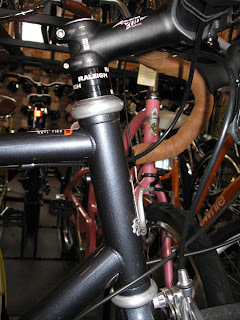 Sometimes, there will be spacers installed on the steerer tube above or below your stem, and you can swap the position of these spacers to lower or raise the whole stem/handlebar assembly, but this is only possible if the steerer tube is long enough to allow for these spacers. In many cases, the only way to adjust your handlebar position is to replace your stem with one that has a different length and/or angle. Both threaded and threadless headsets come in different sizes, and are measured to match the diameter of the steerer tube. Many older bikes came with 1-inch headsets, and this was the de facto standard for many years. Some modern track racing bikes and kids' bikes still use 1-inch headsets. The most common size headset on modern bikes is 1 1/8-inches; this is the new de facto standard. A couple of bike manufacturers have made frames that require 1.25-inch and 1.5-inch headsets, but these sizes are not very common, and replacement headsets in these sizes are getting harder to find. For those of you who like to color-coordinate your bike parts, headsets are available from most manufacturers in either black or silver. Some high-end brands also make them in red, blue, green, gold, and other colors. A brand new headset, before it is installed on your bike, kind of looks like a miniature fire plug, as it comes with the bearing cups and other pieces all stacked together (see image at left). A very basic headset can cost as little as $25. These models will have individual ball bearings held in place with retaining rings. These headsets will require periodic service, typically once a year, but possibly more often depending on riding conditions. A headset overhaul involves removing and cleaning the bearings (or replacing them if necessary), cleaning the surfaces of the headset cups, then re-assembling everything with the proper adjustments. The best headsets can run as high as $150 or more, these models will provide many years of worry-free reliability. Probably more than any other bike component, headsets require many specialized tools for installation and removal. Removal of the headset cups from the frame requires using a hammer plus a headset remover tool. Installing the headset cups requires a headset press. 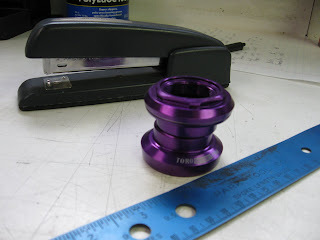 Inserting the star nut into a threadless steerer tube requires a star nut setting tool. A piece of the headset called the crown race must be pressed onto the bottom of the steerer tube; removing a crown race requires a crown race removal tool, and installing one requires a crown race setting tool. All of these tools require training and practice to use correctly, and together can cost almost $600. For these reasons, even experienced do-it-yourselfers go to their local bike shop for their occasional headset installation and removal needs. All Century Cycles stores have these tools in our workshops, and our expert mechanics have the experience needed to handle all of your headset maintenance. This is fantastic content... the normal human interest stories are good, but some technical content every now and then is refreshing... keep it up!